When searching for Creators, you will be able to view Creator profiles to determine whether they are a good fit for your Campaign. 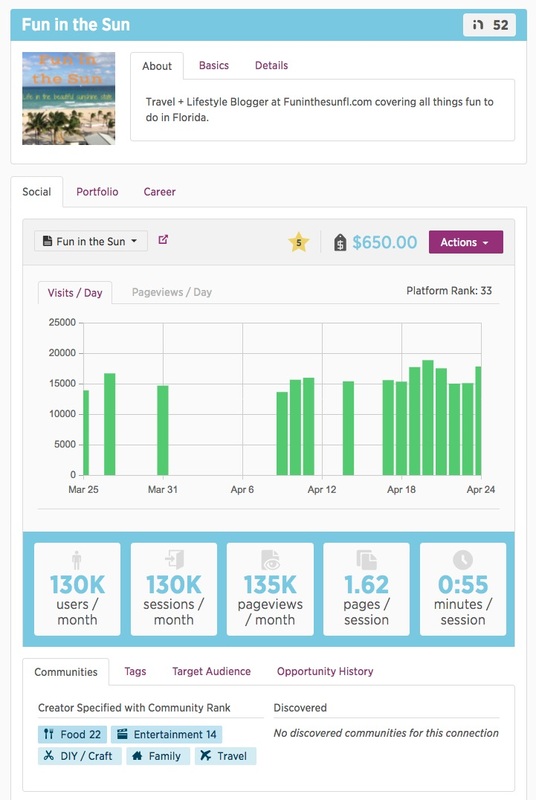 On the Profile page, you will be able to see information regarding the Creators demographics, connections, platform status (InRank), and previous work examples. Profile Avatar - The profile avatar may contain an account banner if the Creator is a Celebrity or if they have upgraded to the PRO plan. PRO users are generally more active in the system and are eager to work with new Brands. InRank Score - This is a platform generated score that is based on the Creator's reach, engagement, relevance, quality, and suitability. This score is on a scale from 1-100 with 100 being the best score a Creator can receive. About Tab - This tab shows a brief description of who the Creator is. They have the option of writing a custom bio or copying a bio from one of their social connections. Basics Tab - This information is manually provided by the Creator and represents the Creator's demographic information. Details Tab - This is Creator-provided information about the Creator. This does not represent the Creator's followers. On the right side of the Creator profile, you can view Featured Connections and Similar Connections to the Creator you are currently viewing. Following the Creator Details section of the Profile page, you will notice the Connection Details section. Each Connection the Creator has in their account will appear in this section. You can view a new social connection by clicking the drop-down in the top-left and then selecting a new social connection. The platform type will be represented by the platform logo next to the social connection's username. Clicking View on... will take you to the live social account. Star Rating - This is a 1-5 quality rating initially given by the platform's internal Curation team. The score may change as the Creator participates in Opportunities and is rated by each Marketer they work with. This rating is based on a number of factors such as reach, quality of content, engagements, profile cleanliness, and frequency of posts. Platform Rank (P. Rank) - This is a score from 0-100 to determine how influential a connection is on a given platform (Twitter, FB, etc). Actions Button - A drop-down option which allows you to add a Creator to a List or send a Direct Offer. Connection Statistics - Displays reach information and a graph to provide a visual of those statistics. Blog statistics are pulled from Google Analytics and represent a 30 day rolling average. Any other platform shows information pulled directly from the live social account. Communities Tab - Displays Communities selected by the Creator as well as Communities that the platform feels are a fit based on keywords found in their social media profiles. Tags Tab - Displays Tags set by the Creator to help explain their social connection. These Tags may vary depending on the Connection you are viewing. These tags are searchable in Platform Search. Target Audience Tab - Displays audience age, gender, and language information as set by the Creator. Opportunity History Tab- Displays all Opportunities a Creator has participated in through the platform. Latest Updates - Displays the most recent posts on the social connection you are currently viewing. Clicking the View Post link will take you to that specific post so you can read more and view engagements on the content. Portfolio Tab - Displays a Creator's Work Examples which grants them eligibility to participate in Content Opportunities. From this page, you can add a Creator to a Creator List, send a Direct Offer for a Content Opportunity, view the Opportunity types a Creator is eligible to participate in, view the Communities and Tags they have selected for their account, and view Featured Work Examples. Career Tab - Displays a Creator's Career Summary and any Publications they have created content for.